Welcome to Day 13 of Crafty October 2014 (check out 2013 and 2012 here) – a month of Halloween Ideas here on The Purple Pumpkin Blog! Pumpkin isn’t just for baking into pies! 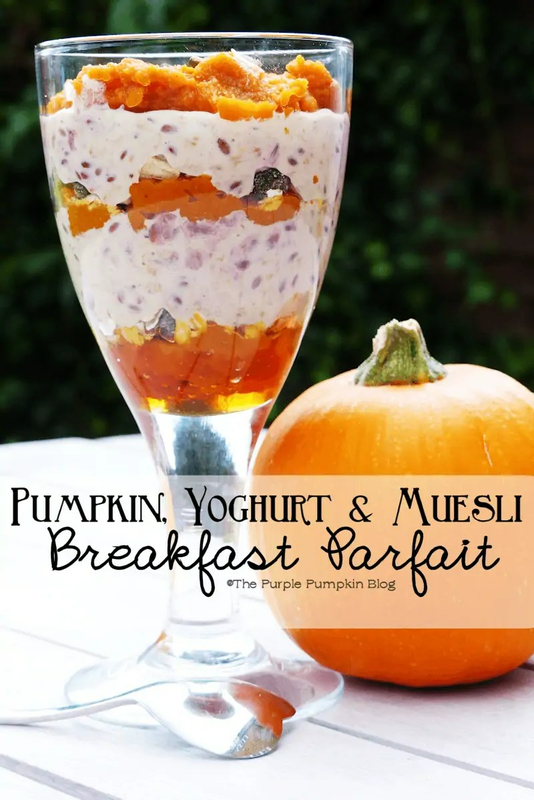 I’ve layered canned pumpkin puree, yoghurt and muesli to create a delicious breakfast parfait – a perfect Halloween treat! In a bowl, mix the pumpkin with spices and sugar to your personal tastes. Take a large wine glass and pour a little maple syrup into the bottom. Make layers of pumpkin, your favourite muesli and Cuckoo Bircher Muesli (or yoghurt) until the glass is full. This recipe is inspired by one I was sent from Cuckoo Foods, along with their range of modern muesli pots to sample at home. However, I found that I didn’t have the all the ingredients I needed when I decided to make it, so made up this tasty breakfast parfait instead! 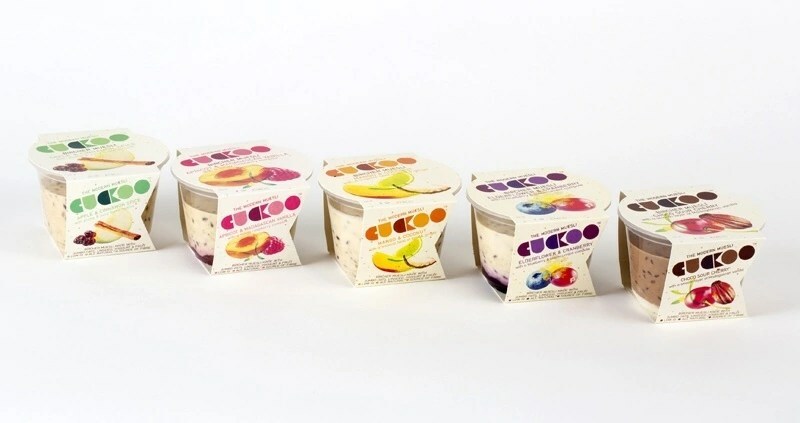 Cuckoo Bircher Muesli is based on a century-old Swiss recipe; made in Britain with home-grown jumbo oats and creamy West Country yoghurt, with added fruit compote and linseeds. which come in a 190g single-serve pot for £2.49 (RRP). They are great for breakfast, an afternoon treat or even as a dessert. The pots are low-GI and a great source of fibre and protein. 1/2 cup jumbo rolled oats. 1 – 2 tablespoons maple syrup. Pinch of cinnamon if desired. 1/4 cup crystallized ginger pieces, chopped. 1/4 tsp vanilla paste or vanilla essence. Mix first five ingredients and put in individual bowls or one large bowl. Mix all topping ingredients and when set, put a layer of yogurt topping on each. Sprinkle with roasted pumpkin seeds or chia seeds. Take a good size piece of peeled pumpkin, chop and cover with water. Simmer for several minutes until very soft and until all water has boiled away. Add a pinch of salt if desired. Scoop seeds from pumpkin. Wash and dry well. Toss in one teaspoon coconut oil and a sprinkle of salt. Roast on baking tray at 150 degrees until golden. Turn often to prevent burning. Disclosure: I was sent this product to sample. All thoughts are my own honest opinions.